Can Fill Dirt Prevent Backyard Flooding? Backyard flooding after heavy rain storms can be extremely annoying and inconvenient. Once the weather clears up you want to be able to enjoy your backyard without having to avoid puddles or muddy spots. However, backyard flooding can actually be more than an inconvenience; it can eventually cause serious problems if it is not properly taken care of. It can damage the plants in your backyard, become a breeding ground for mosquitoes, create an unusable environment until the water dries out, and the excess water can cause problems for your house’s foundation since it can slip into the walls and cause problems such as cracks and mold. There are several ways that you can fix this problem. These include improving soil drainage by changing the composition of your yard’s dirt, land grading, and building a rain garden. 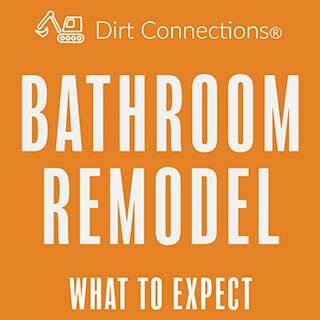 All of these projects are going to require the help of either fill dirt or topsoil to get the best results. 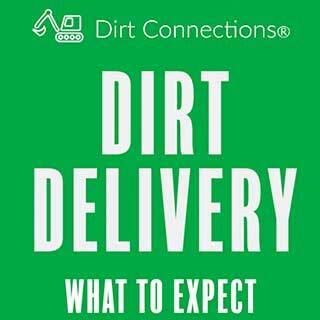 Reach out to a Virginia fill dirt contractor for more information and to schedule your fill dirt or topsoil delivery. 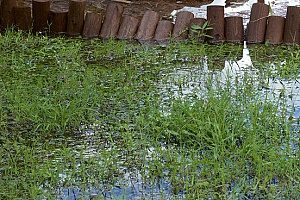 If you aren’t experiencing a lot of backyard flooding, you can take a few simple steps to help improve your soil drainage and correct the problem. You’re going to want to utilize a sandy soil combined with organic matter (like compost or ground pine bark) and mix it in with the existing dirt to a depth of about 12 inches. Changing the composition of your current dirt will allow water to drain far more successfully to avoid creating any unwanted puddles in your yard. This is one of the more forgotten uses for topsoil that can prevent expensive home repairs. Growing plants in these areas with the newly placed topsoil will also help to prevent erosion. You should also target any areas of your yard that are bald spots. Not only are these undesirable looking, but because the soil is exposed it is much easier for it to shift. For most people, this means growing grass and plants. These plants will grow roots that dig deep into the ground and help prevent the dirt from going anywhere, even in heavy rain. If you’re experiencing more than just a little backyard flooding, land grading with fill dirt is one of the ways you can keep the water from collecting. In terms of construction, land grading is a construction process in which land is leveled or sloped to form a base, typically called for when a foundation is needed for a building. 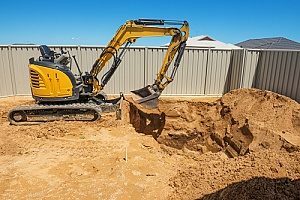 Land grading can also be used to correct drainage problems, prevent flooding, level backyard space so the area is more useful, or terrace a property’s hillside yard. Before you begin land grading, you want to pay careful attention to your yard and take note of how it deals with rainwater drainage. Mark where the water is collecting and try to figure out which way the water is draining. If you notice the water is draining towards your house, you have no choice, you have to grade your land to redirect the water flow away. Water heading towards the foundation of your home can cause serious and costly damage. Luckily, using some fill dirt to change the grade of your land can easily fix the problem. Start off by finding the high point and the low point of your drainage problem. If your yard is relatively flat, it may be hard for you to determine these spots right away. Wait for a rainstorm that creates water flow in your yard. When the rainstorm is over, walk around your yard and take note of where the water is pooling. This can be done sticking a stake or other marker into the ground. Wait an hour and then check the points you have marked again. If the standing water is still there, then this is a low point in your yard where the water is draining to. The high point is where the water is flowing in the wrong direction. For example, if the land slopes down in the direction of your house, the high point is going to be the very top of the slope. The low point is where the water is pooling, so it would be the very bottom of the slope. To fix this problem you need to place enough fill dirt in the low point to make it level with the high point. 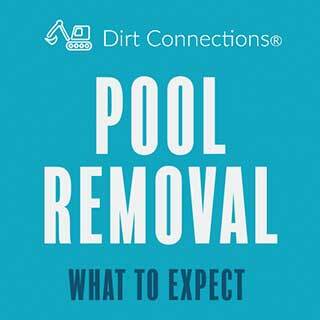 The fill dirt that has been placed will change the level of the slope and prevent water from pooling where you don’t want it to. A rain garden, also called a stormwater garden, is designed depression storage or planted hole that collects rainwater runoff. It’s basically a plant pond; a garden bed that you plant with deep-rooted species. Rain gardens are often used in urban areas to collect runoff from roofs, driveways, walkways, parking lots, and compacted lawn areas so all the water can be absorbed and prevent it from getting into nearby bodies of water. By doing this, the runoff rainwater is able to turn into groundwater and help plants grow, rather than it being sent through stormwater drains and ending up on the ocean. Rain gardens are also extremely beneficial because they can cut down on erosion, flooding, diminished groundwater, and reduce the amount of pollution reaching creeks and streams by up to 30%. 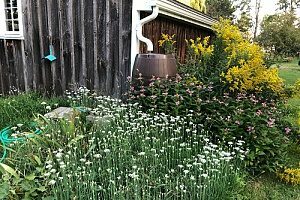 You can either build your rain garden where you noticed a lot of water collecting, or you’re going to have to land grade or build a swale to direct the water to your rain garden in your desired location. Make sure your rain garden is at least 10 feet away from your house to prevent any of the water reaching your foundation. Start by digging a hole in your yard. Use fill dirt to make sure that you have a subtle slope to the edges of the hole so that the water can flow in. Next place topsoil in the hole and plant things like sage, sedges, asters, lavender, coneflowers, and other plants that have an “average to moist” water requirement. These plants will thrive in your rain garden and soak up your rainwater, while also allowing excess water to soak into the soil and become groundwater. There are multiple solutions to address backyard flooding issues you may be experiencing. Projects such as land grading, constructing a rain garden and improving soil drainage by changing its composition can all prove very useful. Completing successful projects like these can improve your yard’s appearance and prevent backyard flooding from occurring in the future. For assistance in determining the quantities of fill dirt and topsoil you will need for these projects, contact a Virginia fill dirt contractor for more information and to recruit Dirt Connections services for your next yard project.